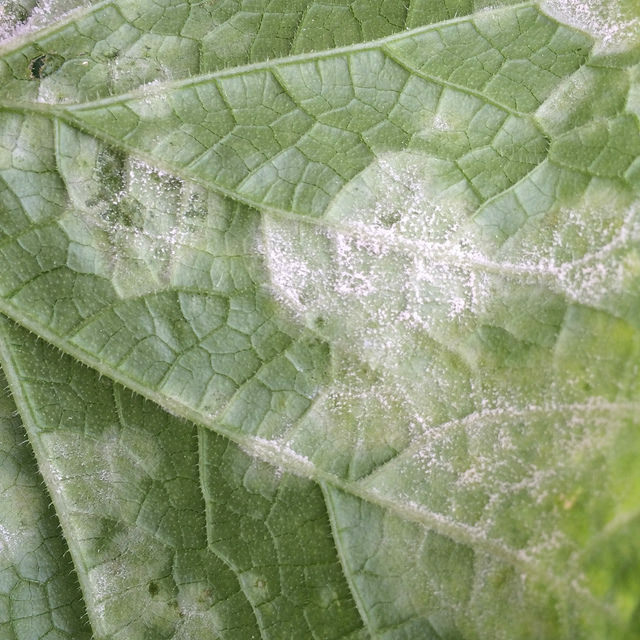 Powdery mildew strikes with little warning, leaving your cucumber and squash foliage looking like it has been sprinkled with baby powder. Initially, powdery mildew affects a few leaves and may go unnoticed, but as the fungus (Podosphaera xanthii) spreads, entire plants may be affected. Although powdery mildew does not directly affect the fruit, infected foliage yellows, turns brown and eventually dies, leaving cucumbers and squash exposed to the sun. When the entire cucumber bed is infected, this may mean significant leaf drop, compromising the plant's ability to make and store food. The resulting fruit is inhibited, lacks characteristic flavor and may wither on the vine. Powdery mildew typically strikes when weather is warm and the relative humidity is high. According to the Cornell University Extension Services, the organisms responsible for powdery mildew thrive in dry soil and often appear first on lower leaves or leaves that receive low light. Overcrowded plants contribute to the problem, as air circulation is inhibited, creating a breeding ground for powdery mildew. This year, I planted cucumbers and summer squash in raised beds and was delighted by their lush growth early in the season, but as warm weather approached and the humidity levels soared, these plants developed powdery mildew. Those I planted 200 yards away in a garden plot show no signs of powdery mildew. In this case, I definitely think that being overcrowded was the major contributing factor to the appearance of powdery mildew. Fungicides are an effective means to control powdery mildew, but pose a problem if your plants are in the production stage, as the fungicides are not safe for human consumption. Treating plants with fungicides may control the spread of powdery mildew, but you won't be able to eat your cucumbers and squash. For best results, treat plants with fungicides before plants set fruit or symptoms appear. For plants that already show signs of powdery mildew, removing the affected foliage or disposing of the entire plant is recommended. This may prevent powdery mildew from spreading to the remainder of your plants. Grow resistant varieties and allow plenty of room for plants to grow. Avoid overcrowding and check your plants often for any signs of powdery mildew. Water plants by applying water to the soil and avoid overhead watering. Saturate the soil to the root level and do not allow the soil to dry excessively between watering. Water early in the morning to allow foliage time to dry. Mix 4 tablespoons of baking soda and 2 tablespoons of horticultural oil (or vegetable soil) to a gallon of water. Add a few drops of dish washing detergent to help the mixture cling to the leaves. Mix thoroughly and apply to your cucumber and squash plants with a sprayer. Coat both upper and lower sides of the leaves. This formula works as a preventative measure, but does little once powdery mildew is present. When it comes to powdery mildew, prevention is key to your success, as once this disease sets in there, is little that can be done to save your cucumbers and squash. By the time you notice the powdery white surface of the leaves on squash and cucumbers, it is generally too late to save them.